It's not uncommon for concrete contractors and builders to receive calls from customers asking why their concrete is flaking and pitted and how the problem can be solved. Spalling concrete can look like round or oval depressions along surfaces or joints. Spalling tends to be most common in cold climates when de-icing chemicals are applied or when seasonal freeze-thaw cycles damage the concrete. Spalls can appear because the rebar has been exposed and humidity and water have begun to rust the rebar or because the concrete joints were improperly built. As weather changes, the concrete expands, causing it to spall, which leads to further deterioration. One technique that can prevent concrete from spalling is to apply a good water sealant to the finished surface to prevent water from entering into the concrete. Spalls can also be avoided if the concrete is managed carefully and appropriate techniques are used when it is being poured, such as providing adequate concrete cover (embedment) of rebar and placing joints at the right locations and at the right distances. Always pay special attention to the edges and corners of exposed concrete to ensure adequate concrete cover as specified by the structural engineer or the ACI. Another key factor to consider is the concrete mix, as excess water content can also lead to spalling. 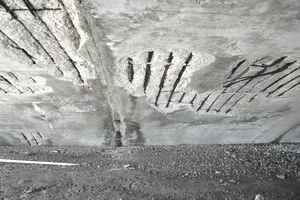 Remedies for spalling vary by the severity of the problem, the type and location of concrete structure, and other factors. When the spalling damage is shallower than 1/3 of the concrete's thickness, the concrete usually can receive a surface repair. If the damage is greater than 1/3 of the depth, steel bars may need to be installed and a full depth restoration may be required. Corroded rebar, due to exposure, must be cleaned at the beginning of the restoration process. Once the rebar is thoroughly cleaned (usually with a wire brush) and all corrosion is removed, the rebar should receive a protective coating of rust inhibitor to minimize future corrosion. Damage on driveways, walkways, and other horizontal surfaces may be repaired with a cementitious overlay. After the overlay has set completely, a waterproofing membrane should be applied to prevent spalling from recurring. Patching may be a repair option for random or localized damage. Patches should extend at least 4 inches beyond the spalled areas. For best results, the surface can be saw-cut in the patch area to help contain and secure the patch. Surfaces to be patched should be free of all debris and fine particles and should be completely dry before patching material is applied. It's best if the old concrete surface is rough to provide tooth for better bonding. The best patching materials are Portland-cement-based or epoxy and should be mixed immediately prior to application, as directed by the manufacturer. The air temperature must be over 40 F for patching or other restoration work to ensure proper bonding and curing of the repair material. Repair materials should have an expansion coefficient similar to that of the original concrete. Any joints that are repaired must allow for expansion of the concrete slab.